While some bloggers may focus exclusively on only one blog at a time, there are many bloggers who manage to maintain several different blogs concurrently. However, not all bloggers do this successfully. Some bloggers compromise quality of content as well as quantity of content by trying to maintain too many blogs while other bloggers have the ability to keep several blogs up to date and interesting to visitors. There are a few key elements to maintaining multiple successful blogs. This article will discuss some of these elements including keeping content original, keeping blogs up to date and budgeting time to work on each blog. Bloggers who maintain multiple blogs must be careful to keep the content of each blog original. Even if the blogger maintains several related blogs it is important to ensure each of these blogs has original blog postings. This will help to prevent blog visitors from feeling as though the information they are receiving is not original. It will also help to prevent readers who frequently visit one or more of the bloggers blogs from deciding to start only visiting one of the blogs because they feel the postings are redundant. Bloggers are also advised against stealing posts from other similar blogs. This is not only illegal but is also not likely to help the blogger much because dedicated readers of the original blog are likely to realize the new blog is simply stealing content from a more successful blog. Bloggers who maintain multiple blogs are also advised to ensure each blog is kept up to date. This means they should take care to post on each blog regularly. Doing this will help to avoid problems which stem from blog visitors feeling as though the blogs are stagnant. Even the most interesting and informative blogs can lose traffic quickly if the blog visitors do not see new content on a regular basis. The Internet is continually evolving and updating. As a result Internet users can afford to be finicky and are not likely to remain dedicated to a blog which does not post new information regularly because they can likely find other blogs available which do provide updates on a more frequent basis. Bloggers who maintain several blogs are also tasked with the dilemma of finding time to work on each blog. However, this is very important because bloggers cannot afford to neglect one or more of their blogs. Doing this can result in a marked decline in blog traffic. 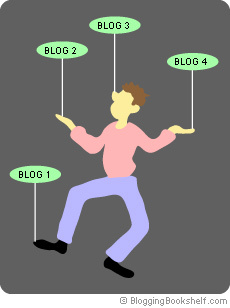 Therefore bloggers who wish to maintain multiple blogs must budget their time carefully to ensure they are dedicating sufficient time to each blog. This time management exercise may start out by assessing the needs of each blog. Some blogs may require a great deal of time and effort each week to keep the blog functioning properly while other blogs may require only a small amount of time for the same purpose. In general blogs which require a great deal of research will require more time and energy of the blogger than blogs which are based on the bloggers opinions and feelings and are therefore not as research intensive. Once the blogger has determined how much time it will be required to maintain each blog, he can schedule his time accordingly. However, he should plan to evaluate how well each blog is operating and may have to make adjustments to the schedule as needed. Additionally, he may also need to make a decision to eliminate a blog or enlist assistance in keeping the blogs updated if necessary.